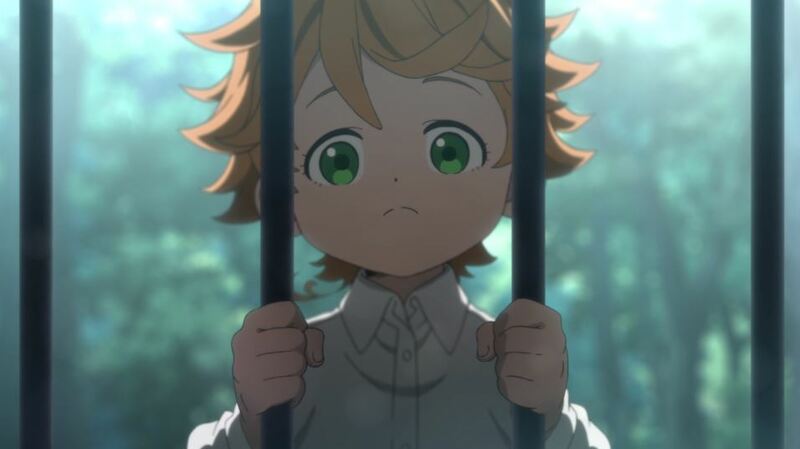 The Promised Neverland’s premiere shows a lot of….promise. That could have been more eloquent. 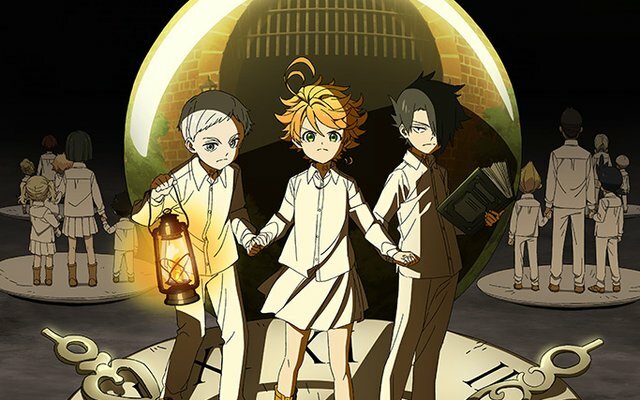 The Promised Neverland (2019), an adaptation of the Manga of the same name currently running in Weekly Shonen Jump, has premiered and I want to talk about it because man, I liked it. I liked it a lot. I have not read the Manga – though I may do so as the season moves forward – so this premiere episode was my first foray into the series. With this combination of subtlety, economy, animation, characterization and pacing, I am excited to explore this series further. 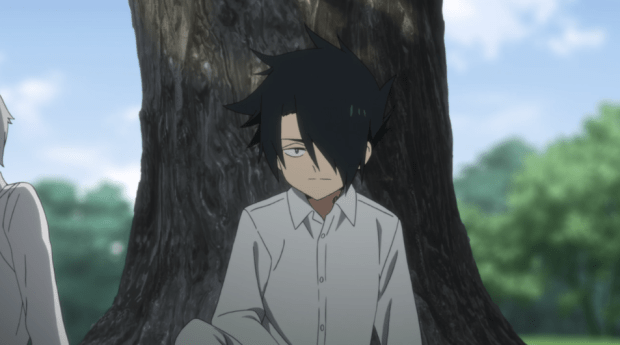 What is The Promised Neverland? There is only one rule they must obey: do not leave the orphanage. The most striking element of this premiere is the immediate sense of dread that infects every element of the story, basically from bar one of the OP. One immediately gets the sense that something is ten kinds of up within the first five minutes of the program. Despite having an on-the-nose cold open, with an announcement of theme that feels more than a bit shoe-horned, the series has a palpable tension and subtlety emanating from its prima facia setting in an idyllic orphanage in the middle of the country. The aesthetic is something between the Handmaid’s Tale, One Flew Over the Cuckoo’s Nest, and Naruto; all the children (everyone around the age of 12) are dressed in glaring white hospital-esque outfits, symbolizing their general childish innocence. The setting, Grace Field House, in design and structure evokes some rural British countryside out of Downton Abbey. From the high vaulted ceilings, and large bedroom which gave me mad Madeline vibes, to the tungsten lighting, everything gives off a quiet, patient, peaceful ambience. Or at least it’s supposed to. This peaceful old-school atmosphere is undercut by small details: the presence of advanced technology. Bar codes and scannners; large ID numbers in a weirdly decorative font tattooed loudly on the children’s necks. Oh no. The tension between these aesthetics immediately gets your creep-radar on the alert. And as the episode progresses, and the children just go about their day, that tension only tightens further and further. You may not even notice that you’re being wound up as the kids do things like, play tag; eat food and just be children. The tension is made all the worse by the energetic lead Emma, who has the bubbly, popular personality typical of Shonen protagonists. She genuinely loves the house; she loves “Mom” – a matronly figure in a maid’s uniform; she loves all her compatriots. She is likeable and charming. The music only enhances the creepiness; used relatively sparingly, and primarily a mix of ambient electronic and piano music. Everything is so quiet that, even though you can feel the tension rise in your gut, you are still lulled into a sense of security. The weirdness is weird, and there are some off details. One of my favorite things about visual storytelling – filmmaking, TV series, Comic Books – and especially time-locked stories (movie and TV) is how, when it’s done well, the storytelling is pure economy: you can explain a character in as little as 30 seconds with a twist of the body, a laugh, and maybe three lines of dialogue. All the named characters are drawn well from the word go: from the somewhat dim Dom; to the adorable Conny; to the mastermind Norman, the angsty-Sasuke-looking rival trope Ray, and our main character Emma, everything needed to explain who these characters are is done instantly within the first three scenes. Emma’s ebullient announcement that it’s time to wake-up, followed by all the children playing rambunctiously in the bedroom immediately convey Emma’s assertiveness, confidence, and her leadership of the group of 38 children. The way she speaks with everybody, giving high-fives to certain children, laughing. The way she talks to all the main characters establish who the character is within seconds. During the game of tag, Norman’s mysterious smiles, and far-off gaze establish him as intellectual and tactician; the way Ray abstains from playing games, or interacting with the others pins down his rebellious nature. All the named characters are developed instantly, making the narrative easy to follow, and establishing their innocence. I also want to commend the work that CloverWorks has done with the animation. Everything is crisp, and clean; the color palate is just soft enough to be soporific; and they’ve translated Shirai’s character designs so that they teem with life, while remaining distinctive. Emma’s character design in particular is to be lauded. Towards the end of the episode, I was growing weary of the pacing a bit. Not too much, that creepiness was over-the-top and the tension was drawn tight. The normality was established and I was expecting that the disturbance – the “call to action” as Joseph Campbell called it, would wait until a later episode. Without going into any spoilers, the ending sets up the story and the thematic underpinning of the show – the end of innocence – expertly, and with a degree of emotional pitch I had not expected. A few sequences toward the end of the episode immediately paid off the tension and when it was finally released, I found myself jumping with terror, and grasping myself, as one does, when horror is done well. But the best part of the end of the episode is not just well…the everything of it, it is how it establishes one of the most important elements of the series going forward: Strategy vs. Brute Strength. In the episode, during the aforementioned sequence where the kid’s play tag, Norman highlights that strategy and tactics – not brute strength – are what often determine the winner of a battle. Emma’s main failing is that she is “Compassionate” and, more to the point, straightforward. This series has a long-game in mind, and the traits that have been highlighted are not athleticism or strength – which are Emma’s forte’s – but wit and strategy. Given that “Punching things harder” has been the tacit philosophy of Shonen stories since time immemorial (see: all the shonen protagonists), emphasizing the use of one’s mind, over the use of one’s fist can prove to be a legitimately compelling stylistic choice if effectively implemented. Especially knowing the stakes involved. There is also a grand sense of mystery, set up in the first episode that, if handled well, could add compelling spice to an already compelling debut. There is very little I genuinely disliked about this show. The only major critiques have more to do with the fact that this is a pilot episode. There isn’t going to be a lot of time to delve into who the characters are; and that’s fine. If I have any complaints, it is that the character’s failings have not yet been emphasized. That is more of a nit-pick, than a major issue. These characters have been established well, but they are still very much in a state of potential, only a promise of something to come. Emma is a compelling lead, featuring all the shonen tropes that make a character likeable, but it is not clear whether the failing established by the show her “caring too much for others” is going to be a sufficient character flaw in the long run to warrant further explanation. Ray is a more one-note character than i’d like; but again, this is the pilot. If I have any complaints, it is only that my attention flagged a little during the middle of the episode; but again, as an introductory episode, that is to be expected. 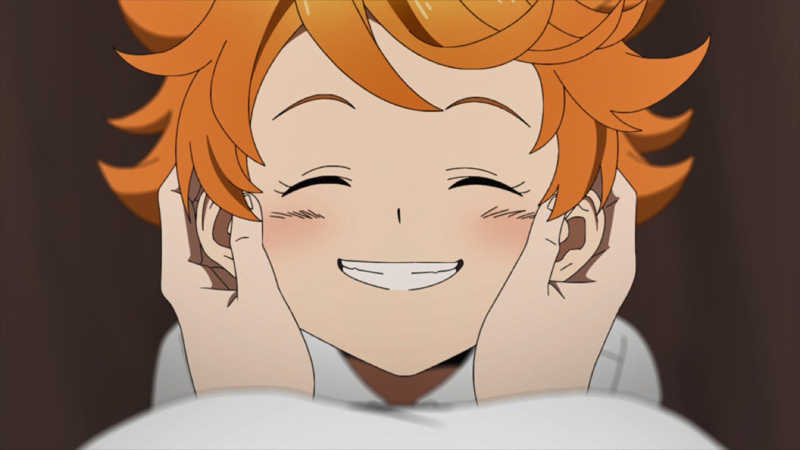 The Promised Neverland is off to a great start, and promises to be an excellent show. While the pacing was somewhat slow, I have faith in where the show is going, and I am invested enough in the characters to be excited for the next episode. Let’s see how that promise lives up, as the season goes on.